Greetings, my retro gaming pals, and welcome back to The Last Official Release. Within these web pages, I investigate the last official games released for your favourite consoles. A full list of what I’ve already covered can be found below, but today, leading on from the Atari 5200 last week, I thought it would be judicious to check out its successor. Originally intended as an immediate replacement for the 5200 in 1984, the launch was put on hold as the company was sold to Jack Tramiel. Finally seeing daylight in 1986, the 7800 set out to mend all the 5200’s shortfalls. For one, it was affordable ($140US in 1986 dollars could be traded for one) but it also had an improved and simplified joystick that was digital only. It also sported much improved graphical power. The sound chip, however, stayed the same as the 2600’s. Considered the best change was the fact that it was 100% backwards compatible with the 2600 – a major criticism of its predecessor. While the 7800 ultimately didn’t have a huge library of dedicated games, there were hundreds of 2600 titles by the mid-’80s. Interestingly, the 5200 was not supported. I guess Atari must have really been trying to sweep that under the rug by ’86 (although the last game for the system was released that year – check last weeks article for more information on that). The 7800 had a pretty decent run; it was discontinued on the first of January, 1992 after selling an estimated 3.77 million units – although no one is really entirely sure (that 3.77 million figure is retailer shipments from 1986 – ’90). Less than 100 games were released for the system, although it’s believed that the total number of official titles could be as low as 60. I’ll be honest, I’m not entirely sure what the last officially released game in the US was. There appeared to be at least 10 games released for the system there in 1990, and while there are murmurs online that the action-adventure Midnight Mutants (Radioactive Software) may have been the last, I was unable to find any specific release dates. What I’m surer about, however, is the final European release. 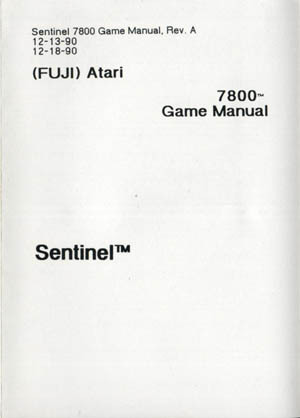 As far as I can tell, there was one single European-only 7800 release in 1991 (and none in 1992), and that was Sentinel by Imagineering. Utilising the XE Light Gun (as the 7800 never had a dedicated light gun) the aim of the game is to protect four different worlds from alien attack. Aiding you is the ‘Sentinel’, which is a giant orange orb that absorbs the alien’s energy. As a nice twist, once the Sentinel has absorbed enough power, it can be shot at and destroyed which will annihilate everything on the screen as a one-time thing. You share a weird relationship with the Sentinel, to say the least. manual, complete with placeholder text and all. As a result, it’s a very basic looking pamphlet. It’s assumed it’s this way because Atari was so keen to push the game out and move on.